that probably made them natural-born failure analysts. Long’s pastime was reading Nancy Drew mysteries. Wright liked to construct jigsaw puzzles. 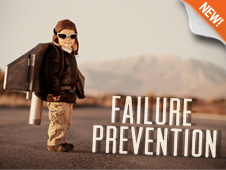 If you have students who enjoy solving problems and mysteries, they probably will enjoy creating a multimedia project with the Failure Prevention module. They may also like reading the article CSI: NASA. It is about the failure analysis lab at Kennedy Space Center. mishaps with rocket hardware. If something goes wrong with a launch, this is the team to call. The article also gives hints about the type of personalities that are better suited for this kind of work. Who knows? A future engineer or failure analyst may be sitting in your classroom who never knew that this career choice is an option. You know how your students ask, “When am I ever goingto use this?” It’s a legitimate question. When they don’t see a use for aconcept, they won’t believe it’s worth learning. You may ask yourself the samequestion when you look at the DIY Podcast: Failure Prevention module. If youdon’t think the module has a practical application, you won’t use it. Standard 2,Benchmark Q: Malfunctions of any part of a systemmay affect the function and quality of the system. Standard 2,Benchmark DD: Quality control is a planned processto ensure that a product, service, or system meets established criteria. Standard 7,Benchmark C: Many inventions and innovations haveevolved using slow and methodical processes of tests and refinements. Standard 7,Benchmark G: Most technological development hasbeen evolutionary, the result of a series of refinements to a basic invention. Standard 9,Benchmark E: Models are used to communicate andtest design ideas and processes. Standard 9, Benchmark H: Modeling,testing, evaluating, and modifying are used to transform ideas into practical solutions. Standard 9,Benchmark K: A prototype is a working model used totest a design concept by making actual observations and necessary adjustments. troubleshooting,research and development, invention and innovation, and experimentation inproblem solving. Standard 11Benchmark K: Test and evaluate the design inrelation to pre-established requirements, such as criteria and constraints, andrefine as needed. Standard 11Benchmark O: Refine a design by using prototypesand modeling to ensure quality, efficiency, and productivity of the finalproduct. Standard 11Benchmark P: Evaluate the design solution usingconceptual, physical, and mathematical models at various intervals of thedesign process in order to check for proper design and to note areas whereimprovements are needed. Standard 12Benchmark M: Diagnose a system that ismalfunctioning and use tools, materials, machines, and knowledge to repair it. Standard 12Benchmark N: Troubleshoot, analyze, and maintainsystems to ensure safe and proper function and precision. Your students can become more technologically literate asthey create a project using the Failure Prevention module. Please Note: If you leave a comment, do not include a link to your blog or other websites. We typicallywon’t be able to approve your comment if you add a URL. When I first learned we were to create a module about failure, I was concerned: Does NASA really want to talk about failure? How can teachers use “failure” in their studies? As I researched the topic, I realized that failure is not always as devastating as it sounds. Failure is a lesson learned. And you know the cliché: You don’t fail until you quit. Failure is not the end; it’s part of the process. That’s what we want students to recognize as they create podcasts or multimedia projects using the new DIY Podcast module, Failure Prevention. Because NASA’s goal is success, studying “failure” is a big part of what we do — we want to prevent failure. 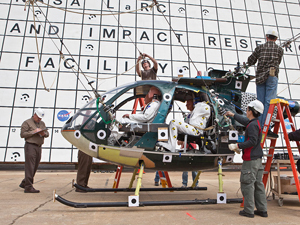 NASA scientists and engineers plan and test to the extremes. They know that a piece of hardware that survives in extreme conditions will succeed under normal working conditions. So where can you apply this module to your curriculum? Science and technology classes would be a perfect fit. We will discuss more about the module and educational standards in a future post. Much of the content of this module explains or shows the ways NASA tests models and prototypes to prevent failure. We have experts Victoria (Torey) Long and Clara Wright of NASA’s Kennedy Space Center. 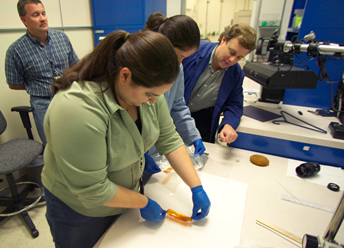 They are materials engineers who analyze failures after they’ve occurred. Besides several sound bites discussing failure prevention and analysis, Long and Wright demonstrate some of the techniques they use for analyzing failure. Camille Alleyne of NASA’s Johnson Space Center was the deputy manager for the test and verification program for the Orion crew and service module. She too lends her expertise about failure prevention. One of the exciting parts of the video clips is our selection of historic failures — exploding rockets. We all know that students will enjoy those. We also have links to recent hardware tests that NASA has performed, including dropping a test vehicle into water. No NASA product about failure would be complete without the audio clip from NASA’s most successful failure — Apollo 13’s, “Houston, we’ve had a problem.” Even though the mission did not land on the moon, NASA gained experience in safely returning the crew to Earth after a malfunction. I hope you and your students are successful when you build a podcast about preventing failure!